So we all know that infant hair snaps right off if the wind blows too hard, but what about toddler hair. Do you feel like your toddler’s hair is breaking or balding? I know my toddler was and that is why I had to really sit down and see what was causing her hair to snap off instead of grow out long like I thought it should be. After thinking through our routines and looking at our habits I finally figured out 5 reasons that my baby girl’s hair was more prone to breakage. I definitely wanted to share them because I know I couldn’t be the only mom dealing with toddler hair breakage. Tying a head scarf on a toddler before bed and expecting it to stay on is like tying floss around a boat and expecting it to stay docked at the harbor. It just doesn’t work. So to get around this nonsense, I have opted for child size hair bonnets and I also use satin pillow cases on Mackenzie’s pillows now. So even if she somehow slips out of her bonnet which usually happens, she will still be laying her curls on a satin pillow case so we’re all good there. When she was sleeping on cotton pillow cases, I noticed that her hair at her nape was very dry in the mornings and roughed up. Now it’s much the same as when she went to bed. 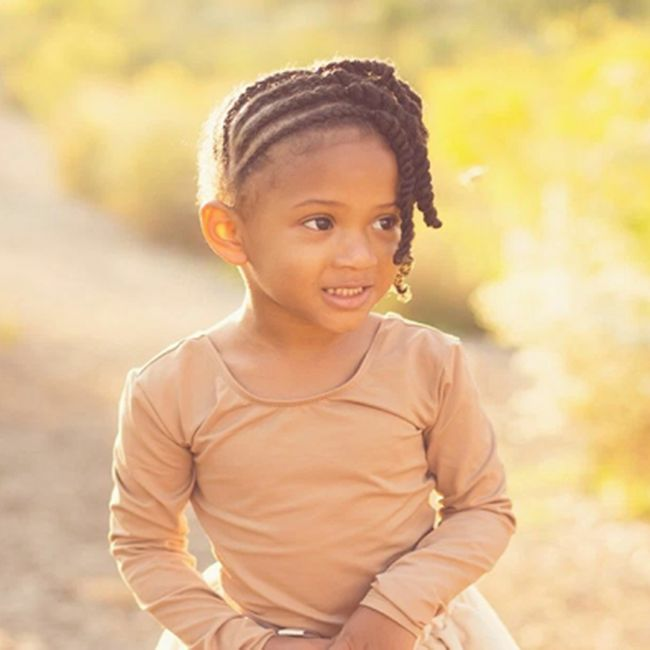 Your toddler may need more protective styling. I used to go for the two huge puff balls because hey let’s be honest, they are easy to do in the mornings when I am rushing. Those huge puffs were leaving the back portion of her hair so vulnerable though. So when she laid down at daycare, she was creating friction on the hair at her nape and then the puffs were also easily becoming tangled, so it was basically a mess. Now I style Mackenzie’s hair on Sundays. I install small two strand twists in the back of her head and then do three ponytails in the front and twist that hair up as well. I had to finally take a look at products. So when I was doing those puffs on Kenzie’s hair, I was using a few spritz of leave in on her edges just so I could smooth her hair up into the puffs. It was definitely not doing her hair any justice. Now when I twist her hair up for the week. I thoroughly cleanse, condition and moisturize her hair and then throughout the week, I mist her twists with a good leave in to make sure they are still moist and not drying out. I am really focusing on a low manipulation healthier care routine for her hair now and I am anxious to see the results of this change. Taking a moment to really think all aspects of her hair situation over allowed me to really take stock of the various factors that were hindering her hair growth or causing breakage so now I think we are well on our way to Rapunzel style hair. This article was written by Christian Byshe on www.chicandcoily.com and published on CurlyNikki. Weigh in with your tips!